To Russia With Love - A Figment of Someone's Imagination - Galernaya St.
After driving under the arch, Bond finds himself in a former Rolls Royce factory near Leavesden Airfield where Galernaya Street was custom-built for him. The real street is short and narrow, it runs in parallel to Neva and not across it, so it doesn't end with such a spectacular view. 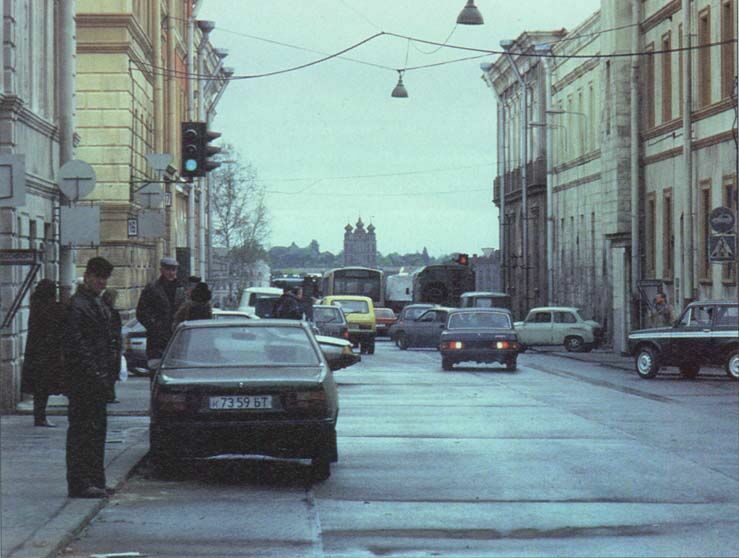 What we see in the film does look a lot like a street of St. Petersburg and may have been filmed there if not for the cathedral in the background - it doesn't exist. It'll make another apearance later, in two different places. The building Ourumov chooses for his escape looks a lot like one of buildings on the street, only the real one has a different number.